While the all too recent breakup of Flosstradamus left us wishing 2016 would just end already, there’s no question that it was an amazing and progressive year for trap music. Today we celebrate that by reminiscing over the best remixes and originals that graced our festival stages, club systems, and spotify playlists for the past twelve months. From heavyweights like Skrillex, NGHTMRE, and The Chainsmokers to rising acts Rickyxsan, Quix, Josh Pan and more, 2016 saw an abundance of artists push the envelope and deliver some incredible music to the scene. So without further ado, get those trap arms ready and enjoy our top 30 songs of 2016. Written and compiled by Max Chung & Nick Isasi. It’s never easy to remix a song that made as big of an impact as Jack Ü’s “Mind,” but Ekali and Graves took that challenge and succeeded in giving the tune a brand new flavor. It keeps Skrillex and Kai‘s gorgeous flowing vocals before dropping off into a drum and flute led drop that flips the song on its head while paying homage to the original. It’s dangerous to load up a song with three such talented artists; the hype could easily overshadow the song. I don’t remember a song having more hype behind it than “Waiting,” the collaboration between RL Grime, What So Not, and Skrillex. Many called it the “Tell Me 2” before its official release. Aside from all of the buzz, this huge collab didn’t disappoint. From its rolling percussion to deep bassline, this one was definitely worth “Waiting” for. There’s a reason The Chainsmokers opened with this track for the majority of 2016; it’s absolutely mental. Or…metal? Either way, Lookas and Crankdat went above and beyond in crafting one of the heaviest trap bangers of the year. It’s almost impossible not to go crazy over the ascending bass and slapping drums that ensue after the low-pitched “woah” vocals hit. Jam out below and watch a crazy guitar cover of the track here. Never has a song embodied the word “banger” as much as LOUDPVCK and NGHTMRE’s “Click Clack” collaboration has. In semblance to the track’s cover art, from start to finish this OWSLA-released single went bananas all year round. From the huge drums to one of the filthiest synth leads you’ll hear in months, “Click Clack” goes ridiculously hard and easily makes it in our top 10. Wiwek and Skrillex’s monstrous “Killa” single totally killed it in every way this year. Becoming an absolute staple for just about every DJ in the scene, the “jungle terror” original had us dancing our sorrows away while singing ‘killa, killa’ the entire time. Launching both Wiwek’s and Skrillex’s careers into an extremely successful 2016, this awesome record grabs the 6th spot on our list. Some songs are created solely for the main stage. DJ Snake’s “Propaganda” is one of those songs, from the tense build up, the perfect vocal drop that EVERYONE can sing along with, to the chaotic percussion that changes dancing into head banging. It hits all the right notes. DJ Snake needed to show everyone he could go hard after the world-wide success of “Lean On.” No one doubts him now. It’s difficult to put into words the hype behind Boombox Cartel and Quix’s massive “Supernatural” original in 2016. Between RL Grime playing out the ID to Mad Decent’s remix competition, the genre-bending collab had the internet going crazy all year round. From the Quix-influenced trap drop to Boombox’s euphoric future bass sound, “Supernatural” offered uniquely contrasting styles never heard before on one track together. Being one of the most sought-after and frequently dropped tracks this year, including it as #4 was too easy. Where were you when Dirty Audio & Rickyxsan unleashed the crunchiest bassline of 2016? Armed with a drum-filled intro and an infectious vocal that is impossible not to scream along with, it invaded the summer music festival airwaves and was able to kick every set up at least one notch. Everyone knew the build up – and the drop still seemed to surprise most. The sheer life-span of the song is what helped the climb up to #3. It goes without saying that The Chainsmokers had one of the most explosive years in dance music history, and it all started when we premiered their first release of 2016, “Don’t Let Me Down.” Dominating charts around the world and going 4x platinum, the track struck gold by combining the New York act’s pop appeal with a dark, infectious trap sound. Leading the charge in further legitimizing trap music to mainstream culture this year, The Chainsmokers grab a close second in our list. What Suicide Squad lacked in plot substance it made up with Margot Robbie and a killer soundtrack that included originals from 21 Pilots, Imagine Dragons W/ X Ambassadors, Lil Wayne, and Wiz Khalifa. 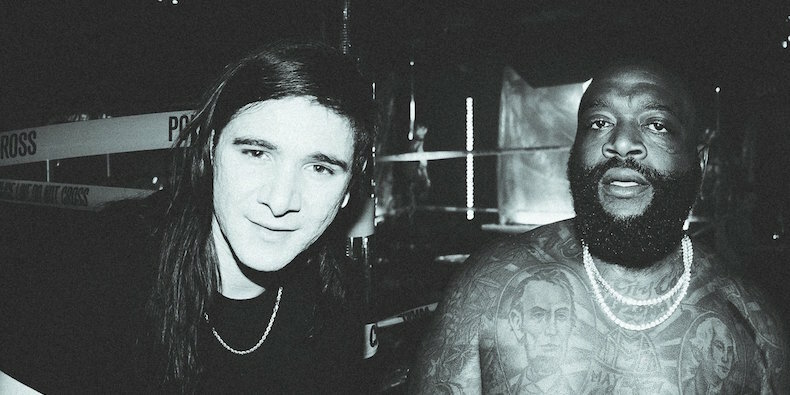 The highlight for dance music fans was an explosive collaboration between Skrillex and Rick Ross named “Purple Lamborghini,”no doubt in reference to Jared Leto’s Joker’s car in the film. When the first twang hits, it’s almost impossible not to go crazy. The song was ingrained in the summer’s festival circuit and made a splash in 2016’s pop culture pool. We had to give it the #1 spot.